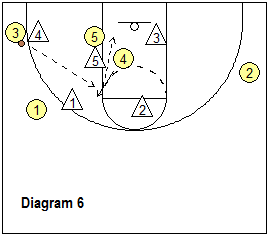 This page discusses the double low stack offensive set and several plays that use it. Using this set often results in open cutters and defensive mis-matches. 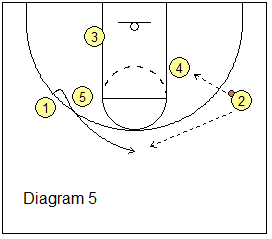 You can start with this set and then optionally flow right into your usual man-to-man offense. It just gives things another look and may confuse the defense. 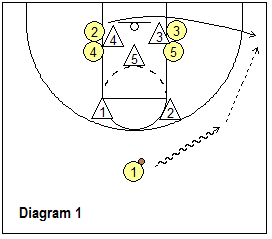 In addition to man-to-man options, several zone plays and out-of-bounds plays are included. 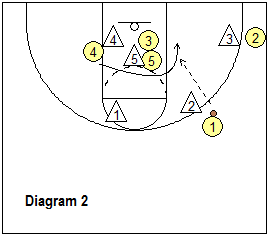 This is a rather detailed play sequence with lots of options if you run it all the way through. See the set in diagram 1 below... the guards (O2 and O3) start underneath the post players (O4 and O5). 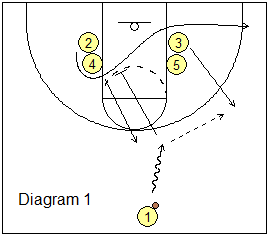 As O1 dribbles into the fore-court, O3 cuts under O5 to the right wing, as O2 curls over O4 and then out to the right corner. 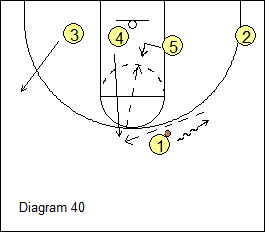 O1 passes to O3 and cuts inside and down-screens for O4 who pops out on top. After screening, O1 moves out to the left wing arc. 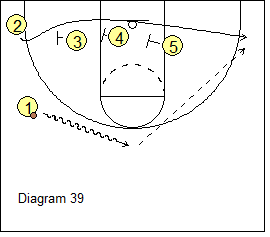 You could run a short version of the play here and have O5 ball-screen for O3 and run the side pick and roll. In this case, O1 would drift down toward the corner for a possible kick-out pass from O3 on the dribble-drive. But let's continue the play as seen in diagram 2. O3 passes to O4, and O4 passes to O1. 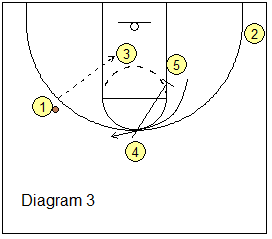 O5 back-screens for O3 and O3 makes the shuffle-cut looking for a pass from O1, and a lay-up (diagram 3). After passing to O1, note that O4 down-screens for O5, and O5 cuts to the top. If the inside pass to O3 is not open, O1 passes to O5 (diagram 4), and O5 passes to O2 who V-cuts to the right wing. After passing, O5 screens away for O1 who cuts to the top. O2 looks to pass to O4 posting up (diagram 5), but if not open, passes back out to O1. Note that O5, after screening for O1, then down-screens for O3 (diagram 6), and O3 cuts out to the left wing. O1 passes to O3, and then cuts through to the opposite corner as O2 moves up. O3 looks at O5 posting up (diagram 7), but if not open, passes to either O4 or O2. 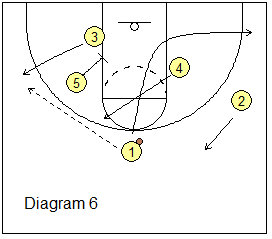 If the pass goes to O4 (diagram 8), O4 looks first for a hi-lo pass to O5 posting up big inside. If not open, O4 passes to O2. 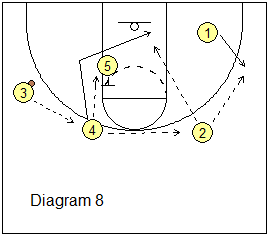 On this pass, O5 back-screens for O4 and O1 moves out to the arc. O2 looks to pass to O4 cutting under O5's back-screen. 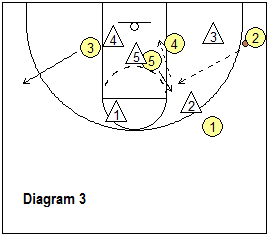 Or O2 might pass instead to O1, and O1 might have an open 3-point shot, or a pass inside to O4 posting up. Pick and roll option. 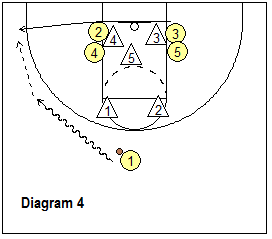 Instead of passing to either O4 or O1, O2 waits for a ball-screen from O5, and the pick and roll play is on (diagram 9). O3 drifts down for a possible kick-out pass. 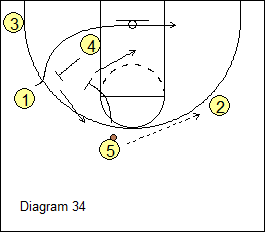 O2 looks to score, but also has O4 for a bounce pass or high lob pass option. O5 pops out on top. Diagram 32 shows a double low stack with the "bigs" (post players) on the left side and the "smalls" (wings) on the right side. O1 dribbles to the left wing. O2 cuts out to the right wing. O3 cuts under a screen from O5 and goes to the left corner. After screening, O5 cuts out to fill the top spot and gets the pass from O1. O5 looks to make the hi-lo pass to O4 posting up big inside (diagram 33). If O4 is not open, O5 passes to O2 (diagram 34), as O4 back-screens for O1. O1 cuts through and out to the right corner if the pass from O2 is not open. O5 screens the screener O4 and O4 cuts to the top. O2 might have an open 3-point shot, but also looks for O1 cutting inside, and then for O5 slipping the screen inside. We start in a double low stack (diagram 38) with the "smalls" on the left side and the "bigs" on the right. O1 dribbles to the left wing. O2 cuts out to the left corner. O1 then reverses his/her dribble and dribbles to the top (diagram 39). 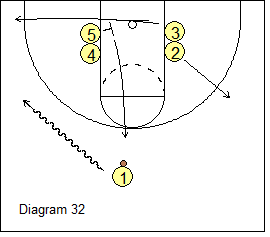 O3, O4 and O5 set a triple staggered screen along the baseline for our best shooter O2. O2 cuts hard along the baseline to the right corner and gets the pass from O1 for the open 3-point shot. If the pass to O2 is not open (diagram 40), O1 should look at O5 who might be open after his defender cheated out on O2. Otherwise, O1 dribbles to the right wing, O4 moves out to the top, and O3 goes to the left wing. O1 passes to O4 and O4 looks for the hi-lo pass to O5 posting up inside. 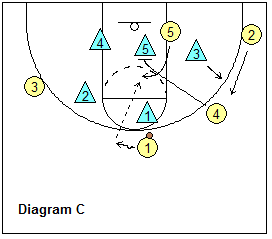 Rather than presenting them all again on this page, check out Steve Ball's (Napa Valley College men's basketball head coach) 17 double-stack options/plays used in his "West Coast 1-4 High Stack Offense". 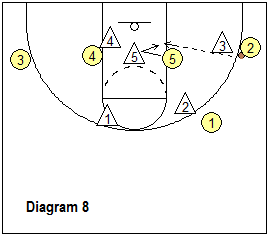 Below are a few double-stack plays for attacking zone defenses. 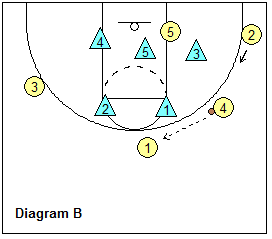 Use this simple play vs the 2-3 zone defense for an easy inside jump-shot. Diagram A below shows us starting with a low double stack set, with guards O2 and O3 on the left lane line, and post players O4 and O5 on the right lane line. Put your intended shooter (here O5) as the low person in the stack. O2 cuts under to the right corner, while O3 cuts out to the left wing. O4 pops out to the right wing and gets the pass from O1. In diagram B, O4 looks at our good shooter O2 in the corner and might even pass fake (to get X3 aware of O2), but instead reverses the ball back to O1. We want X1 guarding O1, and O1 takes a couple dribbles left (diagram C). 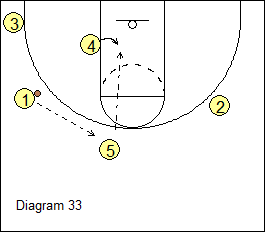 O2 cuts up to the wing (to occupy X3), as O4 sets a good down-screen on the X5 defender. 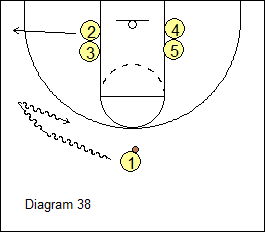 O5 curls around the screen for the pass from O1, and the inside jump-shot. 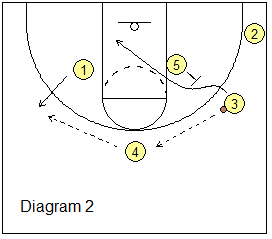 "Vermont" - from DVD "Jeff Walz: 20 Quick Hitters for Scoring Against Man or Zone Defenses"
From Eric Flannery, this 2-3 zone play starts with a double low stack (diagram 1). You can run it to either side and this is determined by the point guard dribbling to either wing. 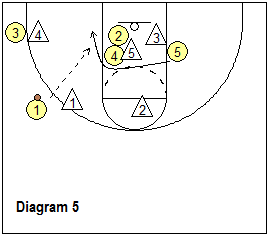 As O1 dribbles to the right wing, O2 cuts hard under O3 and O5's double-screen (screening the outside low zone defender X3). O1 could pass to our shooter O2 for the corner shot. After screening for O2, O5 and O3 then screen the middle zone defender X5 (diagram 2). 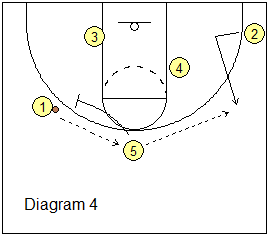 The opposite post player O4 cuts around the double-screen for the pass inside from O1, and a lay-up. If the inside pass is not open, the screening post player O5 flashes to the ballside elbow (diagram 3) for the pass from O2 (or O1), and now O5 and O4 can play hi-lo action, with O5 looking to pass inside to O4. O3 goes to the opposite wing. 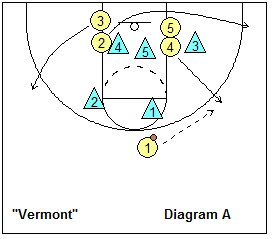 The next three diagrams show the play running to the left side, with O1 dribbling to the left wing (diagram 4). O3 cuts to the ballside corner for a possible pass and shot. O5 is the inside cutter around the O2-O4 double-screen (diagram 5). If the cutter O5 is not open, O4 flashes to the ballside elbow (diagram 6). 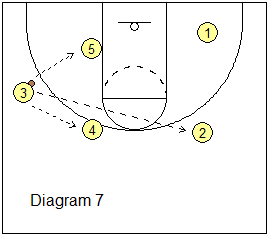 This play starts with the same low double stack seen in "Special" (diagram 7). However, this time O2 and O3 criss-cross and cut to the opposite corners, staying low and below the free-throw line extended (so that the low outside zone defender will have to come out to defend). O1 dribbles to either wing and passes to the corner. The ballside post player O5 immediately finds and seals the middle zone defender X5. 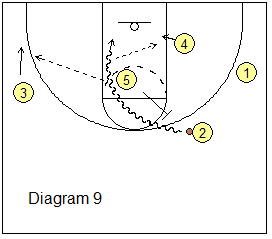 We look to make the quick pass to O5 inside for the post move and shot. 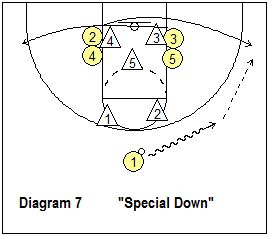 "Special" - from DVD "Eric Flannery: Zone Offense Sets and Ball Screen Continuity"